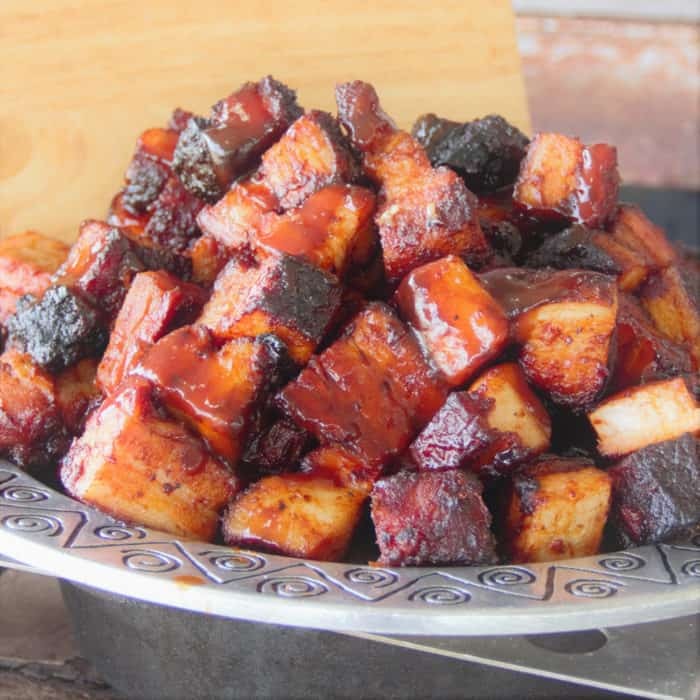 Slowly smoked over oak and cherry briquettes, the pork belly becomes amazingly tender. The cubes are then crisped slightly and tossed in a sugar-salt mixture. Serve these bites with toothpicks so your fingers don’t get sticky. Make sure to make extra – they’ll go fast! Slice pork belly into equal pieces, about 1 pound (1/2 kg) each. Rub all sides of the belly with BBQ rub and place in a bag or wrap in plastic. Refrigerate for 2 to 72 hours. Remove the pork belly from the refrigerator 1 hour before smoking. Prepare a smoker for indirect heat with briquettes and wood chips at 200 to 225 degrees F (93 to 107 degrees C). Smoke the pork belly, fat side up for 90 minutes. Mix together BBQ sauce, orange juice, and cola. Liberally squirt the mixture over the pork belly three times every three minutes. Remove the pork belly from the smoker and let rest for 1 hour. 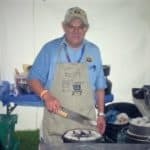 Increase the smoker temperature to 300 degrees F (149 degrees C). Slice and cube into 1-inch (2.5cm) cubes. Place in a pan and toss lightly with additional sauce mixture over the smoker until desired doneness is reached. Mix 1/4 cup BBQ rub, salt, and sugar together. 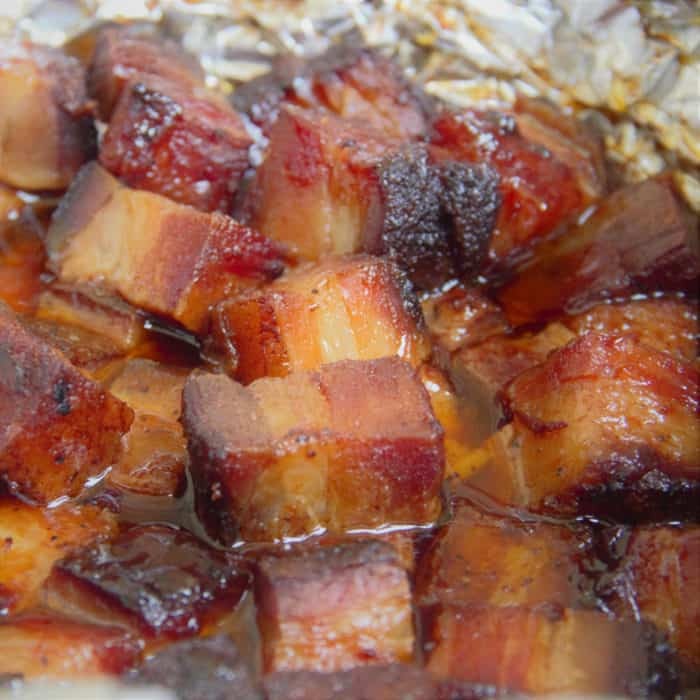 Sprinkle over pork belly cubes and serve with toothpicks. Pineapple Pickled Pork is a sweet and savory meal mixed into one. 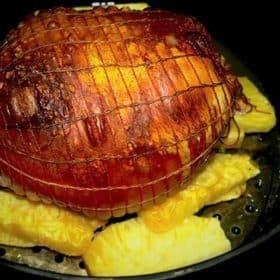 Pickled pork is roasted on top of a pineapple trivet, where it gets all of the flavor and moisture. 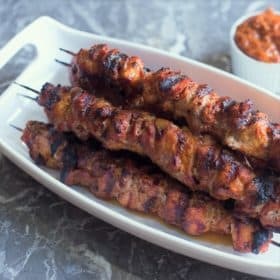 Juicy and tender Pork Skewers are a great way to grill during the summer. 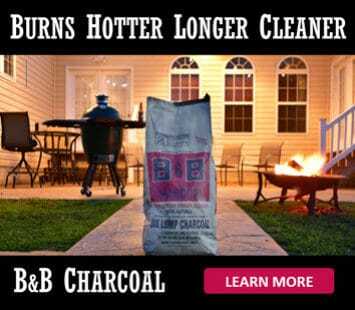 Plus, when you’re cooking outside, clean-up is a breeze. 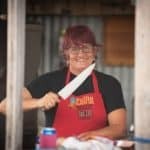 Pork Chops are smoked, then glazed with a sweet Raspberry Chipotle Sauce, before finally being served with a homemade apple and raspberry white wine sauce.